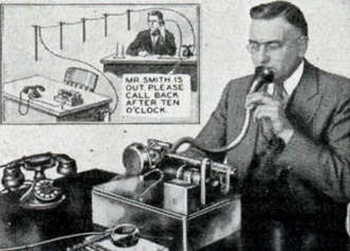 I’d seen a lot of answering machines in later magazines but I was pretty surprised to see this one in a 1924 Popular Mechanics. It even features a dial indicator that shows how many calls the owner has missed. 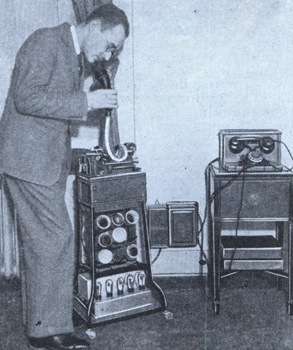 This later product called the “Ansophone” is a an answering machine in the literal sense of the word. It will answer the phone and play a message to the caller, but it doesn’t record any incoming messages. This gigantic contraption seems to be functionally equivalent to the first machine above. You’d think after almost a decade that the technology would allow a smaller device, not a bigger one. I’m guessing that it probably worked a lot better though. At the end of the 1975 “Doc Savage: Man of Bronze” movie there’s a teaser for “Doc Savage II”. Doc! Millions are going to die! Acck! because THE PHONE COMPANY frowned on modifications to their equipment.